Summer is here and it time to look at a great seasonal classic. The Gin & Tonic. I'm going to give you the secret to making the world's best Gin & Tonic. Guess what, the key to this cocktail is not the gin. It's the tonic. I don't care how super-ultra-premium your favorite gin is, it's not going to taste great once you mix it with a flabby, sub-par tonic. Bargain-basement mixer is going to make a bargain-basement cocktail. The best tonic water I have ever had is Fever-Tree Premium Indian Tonic Water. The Fever-Tree Tonic uses premium ingredients such as bitter orange from Tanzania, African Marigold, Lemons from Sicily and pure cane sugar. Dry and refreshing, with complex and subtle flavors, this tonic is the perfect compliment to a premium gin. Garnish with a fresh lime wedge. More information about Fever-Tree Tonic Water and their full range of premium mixers is available at www.fever-tree.com. Great post. 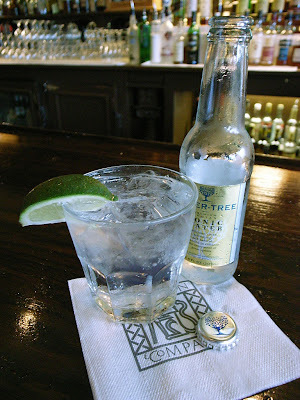 Where can I get Fever-Tree in the US? (Preferably in the SF Bay Area.) The website only lists British outlets. Nice blog BTW. In the SF Bay Area, Fever-Tree is available at BevMo. I'll be happy to review your cinna-carda-mon syrup. Go ahead and ship it to the Cocktail Hour HQ and I'll get right on it! Have you tried Kevin's tonic recipe from Imbibe a couple of months ago? I was just down in CA and I should have gone by BevMo to get some of the FT. Rats. Fever Tree is indeed a great tonic. FYI, over the years I have challenged many of my friends to blind gin tasting sessions and based on smell, neat gin and gin/tonic mixed 50-50 I can tell you that Bombay Sapphire is almost universally ranked very low. Top gins by common consent are Plymouth, Millers, Tanqueray, Hendriks and Gordons. Thanks for the comment heslop. I think all the gins you have listed are very good. I also like Sapphire. I think it mixes well, and that's the true test for me, since I don't often drink my gin straight. In the UK Bombay Saphire is generally only available at 40% strength. Outside of the UK the export strength (47%) is more common and the difference is extraordinary. While living in the UK I would buy the Bombay duty free not because of the price but because of the strength. Jimmy I agree entirely that the tonic is also crucial and that Fever Tree is excellent- unfortunately can't find it here in Japan and have to put up with using Schweppes. I agree - absolutely awesome and the tonic is an important key. Fever Tree is great with the Tanqueray but also try it with Aviation Gin. I tasted these in a little bottle shop in Sydney called Corkscrew Cellars in Bellevue Hill - I don't know where else you can get it from - absoutely brilliant. The only thing that gave it more zing was one tiny dash of angostura orange bitters. My mind was blown. Here's the link to our Blind Taste Test for the best tonic for gin and tonic. A gin suggestion, one I came across this year, is Brokers Premium London Dry Gin. Won quite a few prestigious competitions, of note in 2010, Ultimate Spirits championship in New York...beating out all the "big boys" along the way. Very tasty stuff! What's Behind the Cocktail Explosion?